From the lounge room to the home office, there's always space for a bean bag. Bean bags are a fun and versatile addition to the home, perfect as additional seating or as a housewarming / Christmas present. Our collection of bean bag covers offer you a seating alternative that is easy to store, easy to whip out when you have guests and most of all one of the most comfortable seats in the house! The kids will scramble to be the first to sit on the modern bean bags in your home and you will never have to worry about finding them a spot on the couch again. It's not just the kids who love bean bag furniture throw one in the office, the theatre room or the lounge room for an alternative way to watch TV and movies. Our bean bags are extra-large and their malleable nature makes them a perfect couple's seat. 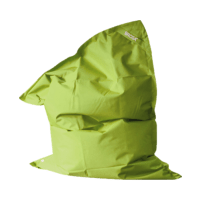 Available in a range of colours and styles the bean bag covers for sale online at Brosa are ideal for anywhere in the home. Our bean bag furniture is available in full colour or patterns and can be easily tucked away when not in use. The beauty of these furnishings is they are completely portable and easy to add to the home when it gets a little crowded on the couch. These items can be used as an extra seat, a reading chair or even taken out onto the decking on a summer's day for a snooze. Each of our designer bean bags can be easily matched to any of your existing furniture. If you are redecorating, these pieces also work well with many of our other options. Select a matching armchair or ottoman. Alternatively, instead of purchasing an accent chair, use one of our bean bag furniture instead! Tuck it away behind your lounge chairs or choose a colour that completely complements it. The choice is yours when it comes to furnishing your home so ensure you make the right decision by browsing our entire collection. At Brosa, we don't deliver only to specific locations. We understand that whether you are in metro Sydney, regional Perth or outer Brisbane you have the same designer dreams. We deliver across Australia so you can enjoy our furniture anywhere. Add some designer flair to your Sydney office or Melbourne home, either way, Brosa has you covered. To find out more about our process, feel free to continue browsing our site. Alternatively, call us on 1300 027 672 and have a discussion with our team.